Photography 1 Edition Unlike many other artistic media, photography's origins are well documented, as are its ever-changing technologies and applications. Written by an international team of experts, this definitive history of photography looks at every step of the field's dynamic evolution, period by period and movement by movement. Each key genre is chronologically presented within its social, economic, and political context, along with close analysis of specially selected works that best exemplify the characteristics of the period. 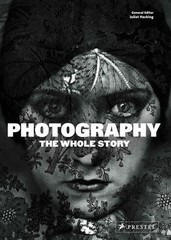 With more than 500 gorgeous examples in black and white and color, the book explores in-depth virtually every aspect of the medium since its first public demonstration in 1839 to the latest innovations: from early portraits and the birth of photojournalism to travel photography and the mapping of the world; from the Pictorialists to the avant-garde; from celebrity and fashion to documentary and landscape. Along the way readers will learn why some photographs are considered iconic, and why the medium as an art form continues to challenge and enthrall us.